The Victorian Electoral Commission Municipal reviews once again has demonstrated its complete incompetence when it comes to Municipal Representation reviews. 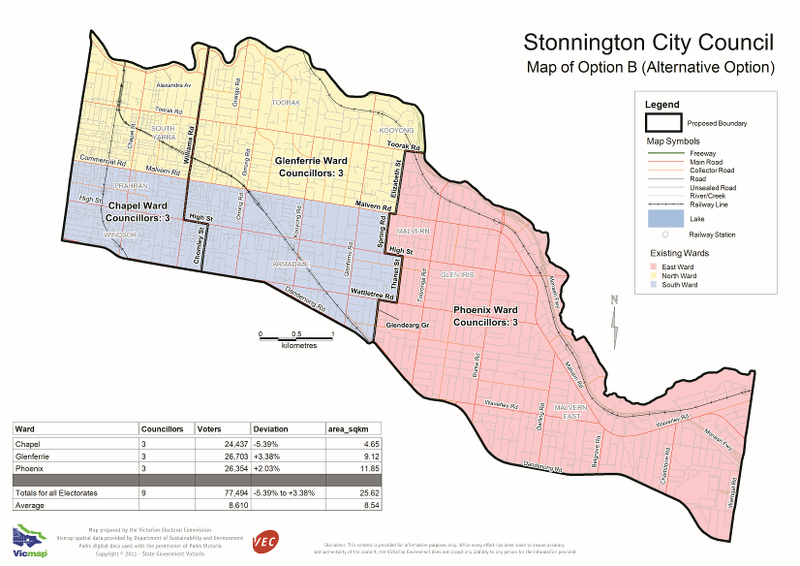 The VEC in releasing it’s final report on Stonington representational model ignored the most popular option “Option B” which would have seen Stonnington divided into three Municipal Wars with each ward returning three members of Council. The notable difference of Option B is that the boundaries would be redrawn on a north south axis opposed to the current ward boundary configuration. The North South boundaries would have better represented the community of Interest and aligned the Municipality ward with those of the former Municipality boundaries. Most notably the City of Prahran. Community of Interest is one of the main considerations required to be taken into consideration in any Municipal review. The current boundaries do not provide a consistent or satisfactory community of interest profile. In a rather lame justification the VEC tied to argue that the existing boundaries were known within the community. Obviously they are out of touch with reality. Stonnington has been a mismatch of community interests with the existing boundaries working against common interests. The former City of Prahran has more in common with the City of Melbourne then it has with Malvern/Chadstone. Residents of Prahran.,South Yarra and Windsor should not hold their breath thinking that former deputy Lord Mayor , now State Member for Prahran, Clem Newton-Brown will lobby for the recommendation to be rejected and for Option B to be the preferred option. Clem is a do nothing, no change sort of man. Clem does not like rocking the boat let alone representing the best interests of his electorate. Option B boundaries would have allowed for a better alignment with State and Federal electoral boundaries. The low participation rate in the municipal review is an indication of the poor quality of public consultation undertaken by the Victorian Electoral Commission. All other options (excluding A and B) where a miss-matched patch work of inconsistencies not worth considering. In a not to surprising move, excluded from the option list was nine single member wards. No explanation given as to why the VEC did not canvas or consider such an option. A nine member single-ward model would have been preferable to the other options presented. Thankfully they did not get any serious consideration.